Quick Tech Trick # 4: How to use Microsoft Word as a Whiteboard? - Blogger I.Q. You are here: Home / Guide / Quick Tech Trick # 4: How to use Microsoft Word as a Whiteboard? Quick Tech Trick # 4: How to use Microsoft Word as a Whiteboard? 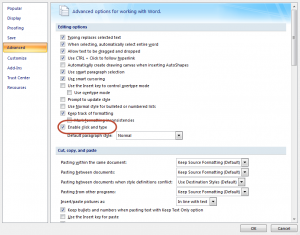 Do you want to type in MS Word wherever you want to? Just click and type away to glory like a mind mapping program. by selecting this option ‘Enable click and type’. This can be found in ‘Advanced’ tab of the ‘Word Options’ window.